Raspberry Pi Forums • Has anyone been able to get glfw running? I'd like to use OpenGL under X windows. Re: Has anyone been able to get glfw running? Yes, just turn it on by using ‘sudo raspi-config’. Select Advanced Options, GL Driver, Full KMS. Then reboot. That sounds great. I enabled GL Driver, Full KMS, and restarted. c application using glfw on Raspberry PI? a message that RandR headers were not found. I got glfw working on Raspberry PI using rpiMike's suggestion! Here's the full sequence of things you have to do. Is the glfw in the debs not worth bothering with? I'm just starting to learn OpenGL, but I know I really want GLES. So I'm reading the OpenGL redbook but taking it with a grain of salt. I don't really want software OpenGL but I suppose it would work to learn from. I just don't want things that conflict. I've heard I don't want to be using Mesa I think. Interesting. I just had it work even without the GL driver enabled in raspi-config. Which seems to crash BTW. Once I enabled it and rebooted the machine seemed generally more sluggish. Then I tried to open a 4.3 meg JPEG I'd just taken in qiv and got booted out of X. Rebooted, same thing happened. Did startx, went into Gimp, loaded up the RAW version of the picture, made some edits, saved it out. Went back into raspi-config, turned off the GL driver, rebooted. qiv opens the same jpeg normally now. Fixed an error (my copying mistake]) in the GL example, compiled it. Decided to see what error message I got if the driver wasn't enabled, but there wasn't one, it just worked. And i just did a screenshot using xwd and it shows it. If I try that with something like omxplayer there's just a black spot because xwd is an old program that works at an X level and omxplayer is at a lower level. I use Gentoo64, the OpenGL driver seems more current and works better. Working my way through the demos. GLFW is a layer up? It looks like it can do OpenGL, OpenGLES, and Vulkan. Not sure, can it be used for baremetal or is x11 etc needed? I think the same thing is at https://github.com/raspberrypi/userland. It comes with some common openGL demo programs that are also found elsewhere (but not optimized for this hardware). I just tried some without X, just the bare command line and some work. hello_videocube works normally, hello_teapot worked but without the overlay images. Hello_tiger worked but I think that's openVG. I wasn't taking notes, just trying to remember. I tried the Gentoo image, and ran the 64 bit Debian Buster one for a few months, but came back to Raspbian for the Videocore stuff. My goal isn't to draw pretty pictures but to make use of the GPU. Routines have been written for it to do FFT and SHA256 (possibly to mine Bitcoin with). There's an assembler at https://github.com/maazl/vc4asm/archive/master.zip, a gpu tools package at https://github.com/anholt/vc4-gpu-tools/ The GPU is powerful, maybe more so than the CPU, but it's weird. Look at some of Herman Hermitage's stuff. In the interim I want to use GLES to do SDR (Software Defined Radio). I've seen it done (Peter Onion). If you try to do the display in X it's hard to get it efficient enough, you end up using CPU to make the display work, which cuts into using it for signal processing. I think you can plot data (several times per second) using vertex shaders. Some of what this does is working into a framebuffer, I thought glfw was putting multiple framebuffer windows on the screen at once, which would be ideal, but now I don't think so. You can do fast graphics with a framebuffer but it's hard to make widgets for controls. Clustering widgets around a framebuffer window seems perfect. Well, that was worthwhile, I updated my userland from github by doing a git pull and built the new version. Hello_teapot still didn't work, it still complained about needing more GPU memory at the CPU/GPU split in raspi-config. 64 MB was always enough for the GPU before but I pushed it up to 128, rebooted, tried it again. No glfw I assume but there's dispmanx, so you could probably make this into a spinning layer. Now the texture image on the teapot is a Big Buck Bunny clip, which plays as the teapot is spinning and moving around. And it will run without X, but only on a Pi probably. It uses GLES/gl.h, EGL/egl.h and EGL/eglext.h from the /opt/vc/include set that comes with it. Startling, but I'm glad it's working again. It was not calling glfwInit(), or my makefile trying to use pkg-config, I got around it eventually. It rotates as it runs. But at 222% CPU by top, ~75% by the LXDE CPU monitor. This is software OpenGL, not what I'm looking for. It does run in a cute little window I can drag around the screen. GLFW_INCLUDE_ES1 makes the GLFW header include the OpenGL ES 1.x GLES/gl.h header instead of the regular OpenGL header. GLFW_INCLUDE_ES2 makes the GLFW header include the OpenGL ES 2.0 GLES2/gl2.h header instead of the regular OpenGL header. GLFW_INCLUDE_ES3 makes the GLFW header include the OpenGL ES 3.0 GLES3/gl3.h header instead of the regular OpenGL header. GLFW_INCLUDE_ES31 makes the GLFW header include the OpenGL ES 3.1 GLES3/gl31.h header instead of the regular OpenGL header. https://github.com/libretro/ludo/pull/93/files but I don't know yet how to use them. 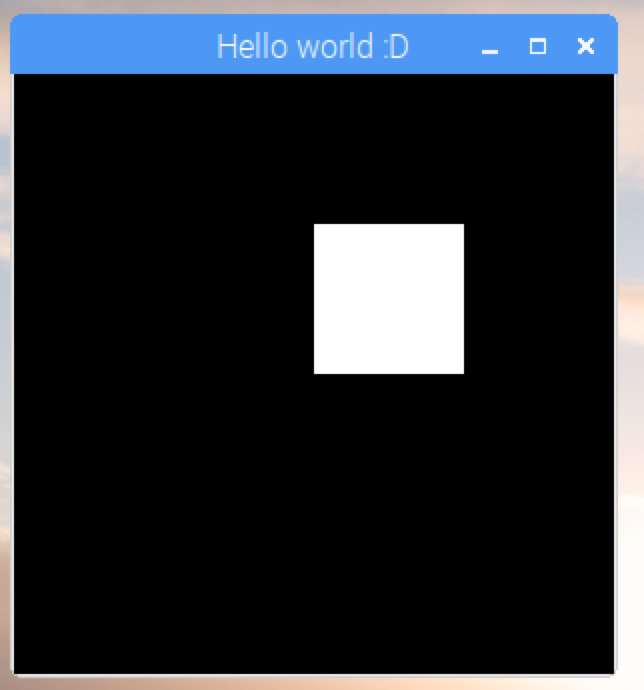 Then again I'm just learning OpenGL too. It's dated December 1, 2018, I doubt whatever it patched made its way through the deb process by now. I'm currently using 4.19 kernel for a particular project, but presently it won't boot with either fake or real kms in config.txt. As I'm interested in how well a particular OpenGL application runs, I've built a card using the very interesting 32-64 bit kernels from Sakaki. I need a ton of libraries building though, so decided to try your simpler examples you've posted about, first. Both fake & real take approximately the same cpu usage, see attached pic's. Much better than 74%, & the frame rates are fine. I have some recent problem (see https://www.raspberrypi.org/forums/view ... 5#p1423435) that causes my gears to be black on a black background. Interesting that building from this source didn't cure that. I tried to use only the Broadcom files but then I had to link a GLUT to get it to compile. But a tenfold increase in speed, this is faster than the Mali in my Rock64 from memory, I think that was only about 700 FPS. I know there is an issue with fake KMS stalling during boot on 4.19, but full KMS is working fine for me. Admittedly I'm also testing a Debian Buster build so have a significantly more recent Mesa. How far does it get during boot for you? Interesting, Gentoo64 has Mesa 18.3.1 but Kernel 4.14.90 with fkms-v3d and CMA 256. Switching to kms-v3d does not work, it give a blank screen, a reboot brings back up fkms mode. Sakaki makes it hard for me to break Gentoo64 these days, it can fix itself . Wonder if anyone has kernel 5.x working yet? I think there are also Pi improvements in 4.19 but my plays with BRANCH=next did not interest me enough to run many tests. 4.14 with Raspbian boots fine with full KMS, so I don't know what has been done with Gentoo64. I'm working solely on 4.19 now. There are a bundle of patches gone in to fix up numerous build warnings in the downstream drivers with arm64, though very few were likely to cause any real problems. The V4L2 camera driver is working on arm64, and I have all the patches to get the V4L2 codec driver working. I've had GStreamer playing videos with hardware acceleration on arm64 to kmssink or glimagesink, so multimedia on arm64 is nearly there. I need to double check encode, but it should be fine too. Yes, I have booted an upstream 5.0 kernel and it worked reasonably. Nothing particularly exciting in it, and won't get much attention from us as it isn't an LTS kernel. Just the black screen as I mentioned in another post. I'll try to find my serial cable & give you something more useful. Do you have a pointer to that Buster image that I can put on a card, then I can try it for you? So that's what I get with fake KMS - it's getting most of the way through booting and mounting stuff, and then stalls. I suspect something isn't correctly linked together/initialising within the display drivers - they did work recently for things such as not stalling should a DSI screen not be connected at boot. tvjon wrote: Do you have a pointer to that Buster image that I can put on a card, then I can try it for you? I believe it's in progress as an alpha release - Buster is expected to release around June/July this year, and is considered unstable at the moment. I got given an SD card to clone by Simon. Looks like time to go back and try 4.19 now. Wonder if it will work on Sakaki's new dual 32/64 Debian? Weekend starts tonight Pi breaking time?